I don’t know about you but if given the time and preference I’d always opt for something with spiciness and protein for breakfast. I’m definitely a cheese lover so if that can be roped in, all the better. Realistically most days are a quick nosh on something lack luster like toast before I head out for parts unknown or to ferry kids to school. 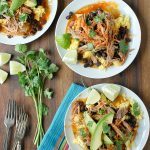 Last week I shared an utterly delicious slow cooker recipe for pork shoulder that I made into Slow Cooker Spicy Pork Pineapple Tacos. Slow cooking has come such a long way since the non-descript dishes of bland meat and soggy vegetables of my childhood. I love convenience as much as the next girl but only when it produces delicious food as an end result. Those in the Boulder Locavore household loved the shredded pork recipe. Fortunately I was stealthy and hide some of it, for as soon as I had my first bite the perfect breakfast idea popped to mind: Spicy Shredded Pork Breakfast Tostadas. We are all busy and if more than one meal can be eked out of a main protein, I’m delighted; especially when it takes a different turn. Though the Mexican-inspired spice holds true for the tostadas, the form, texture and layering of flavors make this an entirely new showcase for the shredded pork. 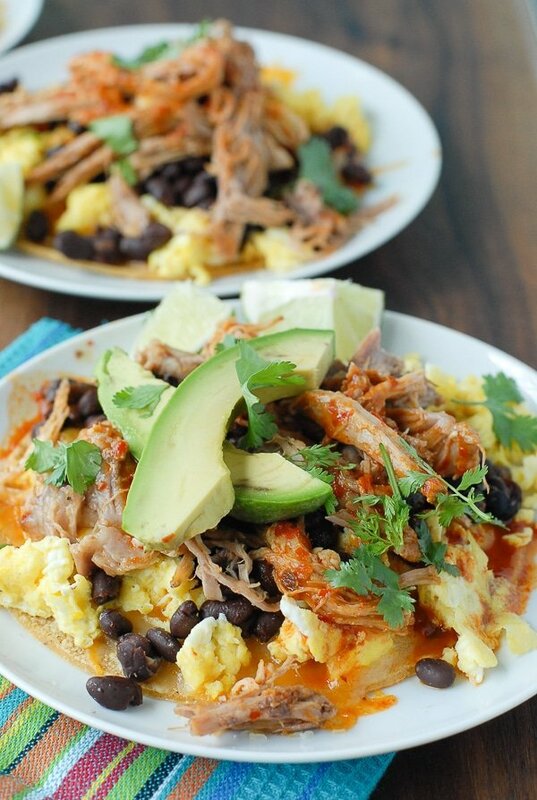 Spicy Shredded Pork Breakfast Tostadas are hearty, filling and the perfect breakfast to set the day straight. They certainly do not need to be contained only to breakfast and would be well-suited for lunch or dinner as well. The preparation is simple; a bit of avocado slicing, tearing of cilantro leaves and preparing black beans from scratch or from a can, your choice. 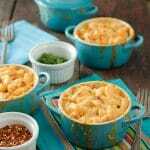 For me this is the perfect comfort food and I hope you’ll agree! 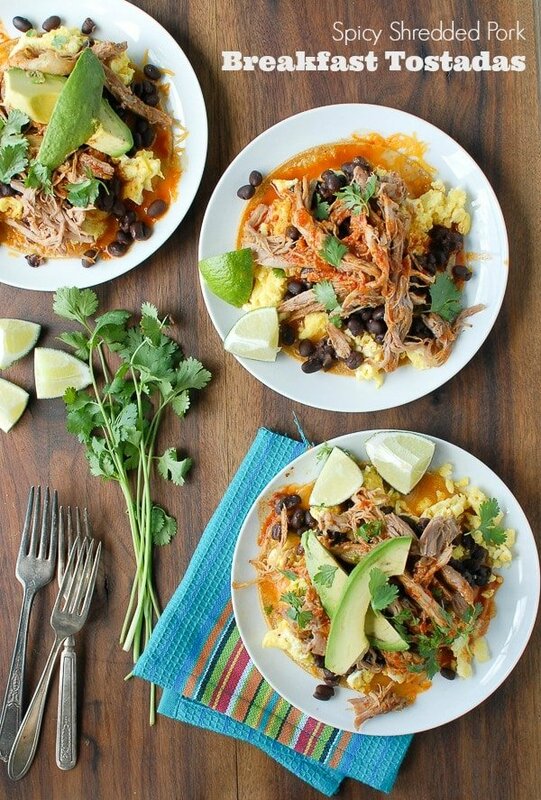 Spicy Shredded Pork Breakfast Tostadas are a filling, earthy start to the day or perfect for any meal. Layering of black beans, eggs, cheese, pork and avocado are together irresistible and yet simple to prepare. 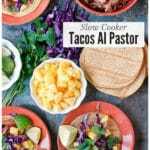 The bulk of the dish comes from a slow cooker recipe for the pork that is effortless but yields an sultry, spiced pork that makes these tostadas really special. The recipe is broken down into per tostada portions so multiply the ingredient amount by the number of desired servings for the total quantity needed. Either in a dry skillet or microwave, sprinkle grated cheese onto the tortilla and cook just until it begins to melt. Place tortilla onto serving plate. 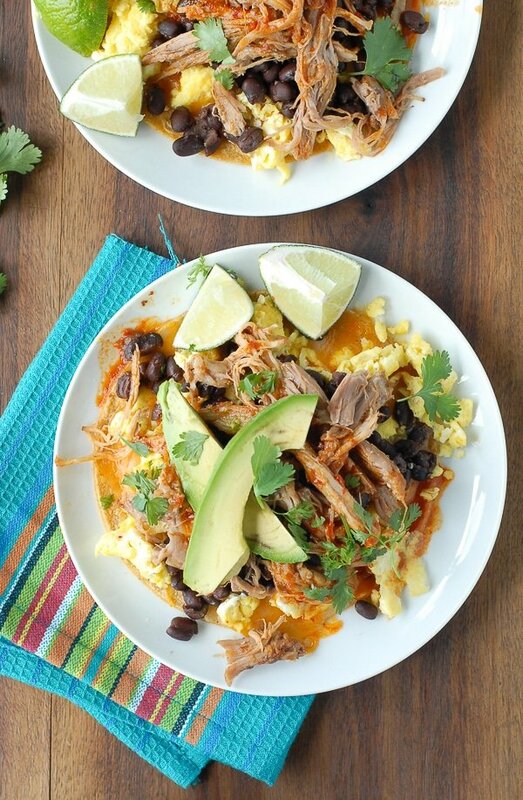 On top of the melted cheese, evenly layer the prepared eggs, then the black beans, followed by the shredded pork. 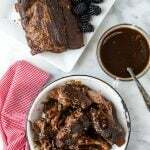 Drizzle with some of the sauce from the slow cooker. Place the avocado slices on top of the tostada and sprinkle with cilantro leaves if desired. Serve with lime wedges. 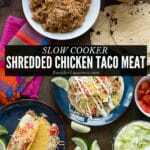 Note on recipe preparation time: If making the slow cooker shredded pork from scratch for the tostadas (versus using some from preparing the Spicy Pork Pineapple Tacos) add 4-8 hours for slow cooking. I’ve been dying to make tostadas lately and this is definitely the first recipe I’m going to make!! Pinned! I may have a sweet tooth but I LOVE a savory breakfast!